Kestell is a peaceful hamlet snuggled up against the hillside and set off by the monumental Dutch Reformed Church building, designed by the famous architect Gerard Leendert Pieter Moerdijk, who also designed the Voortrekker Monument in Pretoria. This church and numerous other buildings, public and private, are built from sandstone. Many date back to Kestell's early days at the tail end of the Anglo-Boer War. Only a few roads in Kestell are tarred, some are brick paved and there are no traffic lights and no traffic congestion. All conveniences are well within walking distance for anyone living in the village. The village acts as the centre for trade, churches, education and administration for the surrounding, mainly maize, farming areas. The village has a post office, police station, a bank, 2 ATMs and a few small shops. There is only one garage situated at the entrance to the town. Kestell is ideally situated for sightseeing of some of the Free States most wonderous sights. 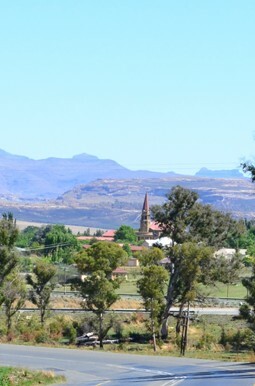 So	come and visit us, you will not find a quieter more laid back place anywhere in the Eastern Free State. This photo of the village was taken by Elaine Potgieter in October 2011.